There’s a great new offer from Kellogg’s: Buy 3 boxes of specially marked Kellogg’s cereals and get a $10 bonus certificate to use on electronics, sporting goods, books, movies & more! Participating products are: Kellogg’s Frosted Mini Wheats, Raisin Bran, Fruit Loops, and Frosted Flakes (remember, the boxes must be the specially marked ones). Codes must be entered all at one time in order to qualify to receive the certificate and must be entered by 09/30/2010. Certificates expire 11/30/2010. There is no limit to how many certificates you can earn! You can use one certificate per purchase. Keep your eye out for these boxes, especially if you spot a great sale! I’m thinking we can all be set for birthdays and two Christmases! 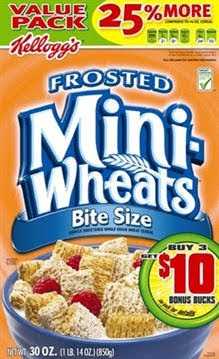 Be sure to print off this $1.50/2 Mini-Wheats coupon in case you find some on a great sale. You can print two per computer by using your browser’s back button until you reach the original print screen.